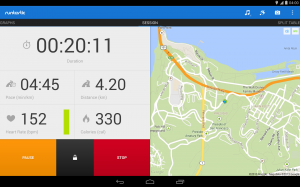 Runtastic is an application that tracks workouts in real-time with built-in GPS. It works with different activities such as running, jogging, cycling or walking. The application keeps track of cardio training to help us achieve our goals. Runtastic is able to keep record of the training time, the distance, elevation, pace, speed & heart rate, or the calories we burned. We can adjust the training to the objectives we want, not only by choosing the sport that better suits us, but also by selecting goals based on our special needs. These goals can range from a fixed time dedicated to training up to a certain number of calories consumed. It also allows you to set more practical goals, such as running a marathon, weight loss or building endurance. Runtastic Running & Fitness is fully integrated with Google Maps, and we can see the workouts we have made accurately plotted on a map. The app keeps the historical report for comparisons. 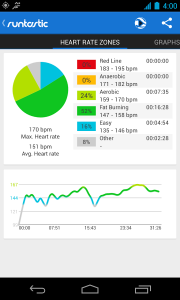 It also offers the ability to display all kinds of statistics to have a better workout control. The latest update provides a compatible version for tablets and includes a listening mode for running stories. This option allows you to hear a story of 40 minutes long about one of the four themes available at the moment: a discovery of Rio De Janeiro, a tribal adventure, an escape from Alcatraz or a guided workout from Gerhard Gulewicz. Training results can be uploaded to social networks like Facebook , Twitter or Google+ , where we can compare the results with those of our friends. The application is available for 4.99 € in a PRO version with all the features, but it also has a free LITE version with some limitations. It is available for Android, iOS, BlackBerry and Windows.